Con tantas opciones gastronómicas para elegir en Nápoles, asegúrate de tener una comida memorable con la ayuda de un experto guía que conoce la ciudad por dentro y por fuera. Elija a qué hora le gustaría que lo recojan en su hotel, y disfrute de un recorrido a pie y en coche por las calles de la ciudad. 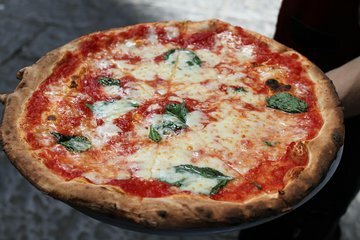 Deténgase en varios puntos para tomar fotos y escuchar historias de la larga e intrigante historia de la ciudad, luego diríjase a un restaurante elegido a mano para saborear deliciosa y auténtica pizza napolitana. Visita turística a Nápoles y cena de pizza. Conduce y camina por las calles de la ciudad mientras escuchas historias históricas intrigantes. Our host contacted us by email before the tour to confirm the meeting location and pickup. He took us on a wonderful walking tour of the city which was beautiful. We thoroughly enjoyed the experience. I would recommend this tour especially on your first night in Naples. It is very helpful to orient you to the city in a more personal way than taking a city-wide tour..
We arranged the tour for our first evening in Naples. Mario our guide picked me my wife and two teenage girls up from our hotel on time at 7pm as arranged. He drove us to a nice restaurant overlooking the bay where we had a basic pizza meal. We were left alone to enjoy our meal. Mario joined us about an hour later and then took us on a walk around the bay and through some very pleasant streets near the Royal Palace. Mario told us about some of the history of Naples and gave us advice on where to visit. The walk lasted over an hour before returning to the car to be driven back to our hotel. Overall it was a very pleasant evening which we all enjoyed however maybe a little over priced. Food OK but we didn't do this for the food but to get a feel of the city just after our arrival. I was travelling with my sons without my husband and didn't want to accidentally walk into a bad area. Unfortunately it was raining, but this didn't spoil our enjoyment. My friends and I could not have been happier with this tour! The pizza place we were driven to was very good and right across from the water. Mario was quite possibly the kindest and most perfect tour guide in all of Italy. He was so personable and wanted us to have the best time in Naples and took us to the beautiful waterfront and shopping area. He grew up in Naples so he knows everything and will answer any questions you have. Go on this tour during your first days in Naples and you will become well acquainted with the city! I would recommend this to anyone. Grazie Mario! This was an awesome way to begin our vacation in Naples! Mario was the perfect guide who answered all of our questions, made great suggestions of things to do in the city, and was just an amazingly nice person. The pizza we had was absolutely delicious and the restaurant was located across from the water. I would recommend this tour to anyone as an introduction to the historic Napoli.